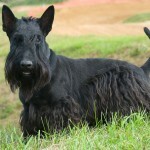 Scottish Terriers have been around for a very long time, are very popular, but are very difficult to train. Even when trained, they must continue to be given consistent commands. 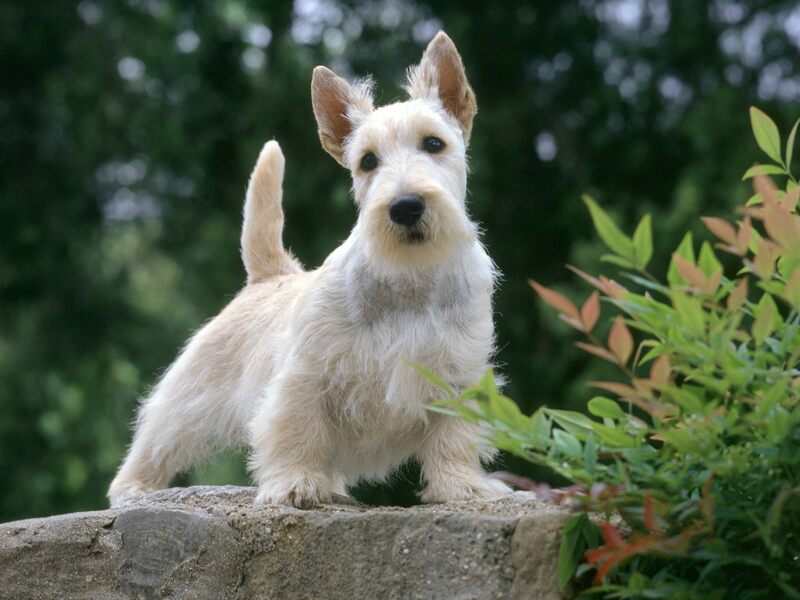 Terrier-like dogs in what is known known as the U.K. have been written about for almost as long as writing has occurred in the British Isles. In the first century A.D., the ancient Romans invaded Britania, although they did not get as far as Scotland. Yet, they did admire the dogs that they did find, and they quickly became a major export. 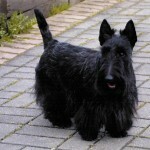 References to the Scottish Terrier specifically are hard to find. They seem to have been alluded to in the book The History of Scotland 1436-1561 by Don Leslie. 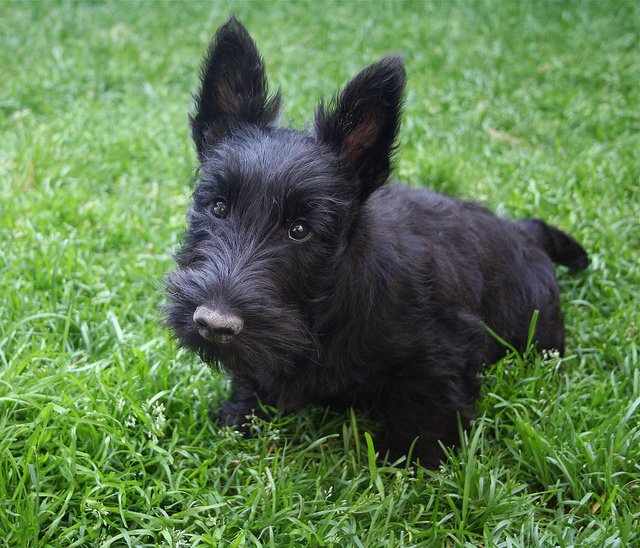 At around 1636, Sir Joshua Reynolds made a painting of a young girl holding a dog resembling the Scottish Terrier. 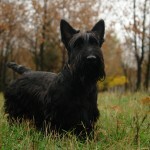 Later experts agree that there seemed to be two types of terriers up to the early 19th century: a rough-haired Scotch Terrier and a smooth-haired English Terrier. 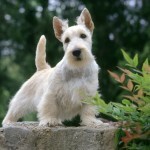 In the 1870s, the Aberdeen Terrier (named after the city, with its abundant dogs) was exhibited and in the early 1890s, they crossed the Atlantic to come to the United States. However, it was not until the period between the first two World Wars that they became popular. 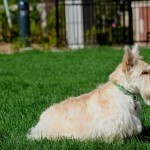 Although they can live fifteen (and possibly more) years, they are subject to numerous health issues. They have the genetic tendency to get Von Willebrand disease and craniomandibular osteopathy. 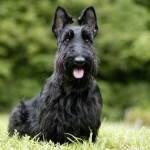 They also often get eye conditions (such as glaucoma and cataracts), parasites, mange, and they have leg spasms called Scottie Cramp (named after them) as well as other health concerns. 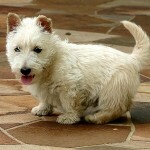 They have a greater risk of getting up to six different cancers than do other pure-breed dogs. They have been called brave, quick, self-assured, independent, feisty, playful and most of all, alert. 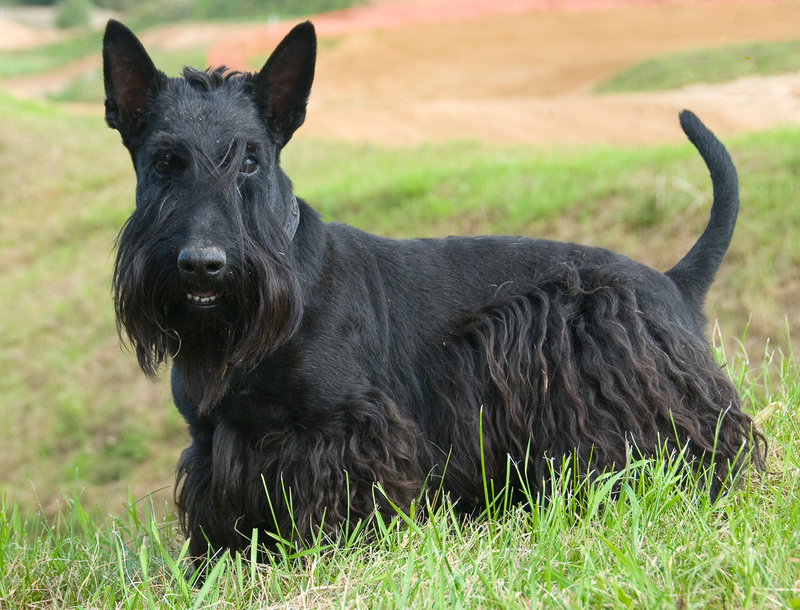 Scottish Terriers will be okay in apartments as they are moderately active indoors and will survive without a yard. However, it is better if they are given a daily walk as they can display behavior problems otherwise, and if they are allowed to roam in a large fenced-in yard. They are notoriously difficult to train. They are sensitive to being corrected, and will respond to your commands if you are firm and confident. However, if he senses that you are wavering then he will ignore you. This dog can challenge even family members whom he views as not having leadership over him. There are very many things that these dogs do and are. 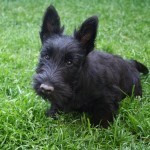 They are brave, alert, hardy, lovable, charming, full of character, playful, and very good watchdogs. 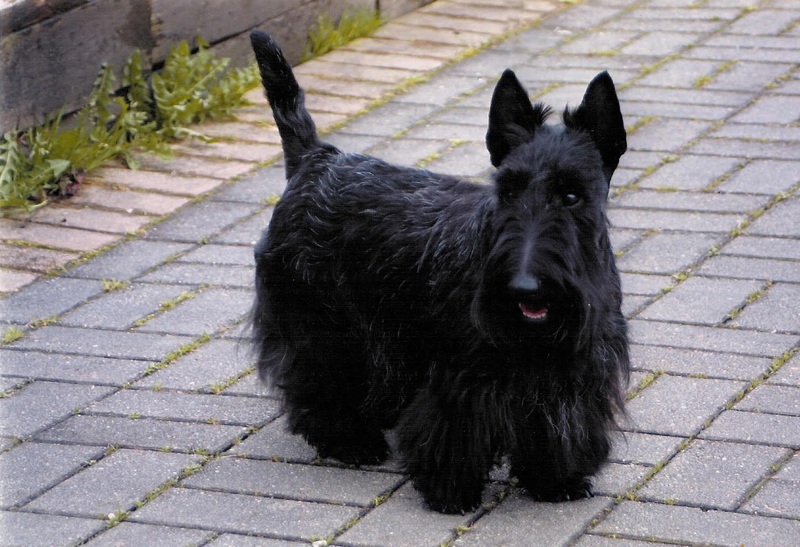 They can be very stubborn and prone to Small Dog Syndrome, in which he views himself as being the leader to humans, and to separation anxiety. 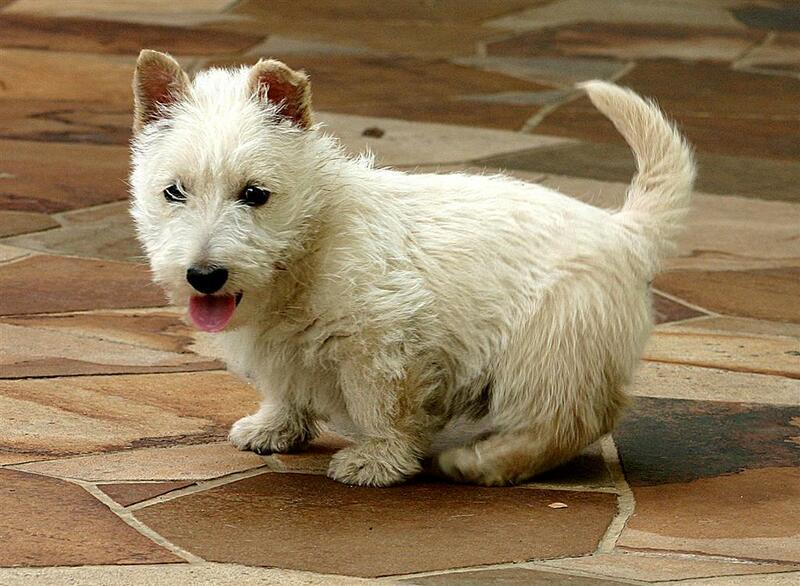 These dogs are sturdy, little dogs with short legs, and can appear to be even shorter than it actually is. The head and skull is long and big in proportion to the rest of the body, much like that of a dwarf. They have almond-shaped eyes which are small and placed well apart from each other. The teeth meet in a level bite. The front feet are round in shape and larger than are the back feet. The tail is thicker at the base. They are quite short in height and are almost always precisely 9.8 inches (25 cm) tall, and are somewhat light in weight, as they weigh 19 to 22 lbs (8.5 to 10 kg), with females weighing 1 lb (0.5 kg) less. 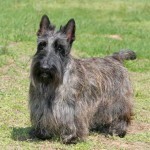 They have a hard, wiry outercoat, and a soft, dense undercoat. They are usually monochromatic, and are overwhelmingly black, and sometimes all-white, although they can be off-white or cream in color, or brown, or sometimes other colors. Occasionally, they can be of two or more colors. 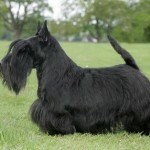 They ought to be groomed at least twice a week and, in some instances, professional grooming may be prefered. They need relatively frequent baths, which they dislike. 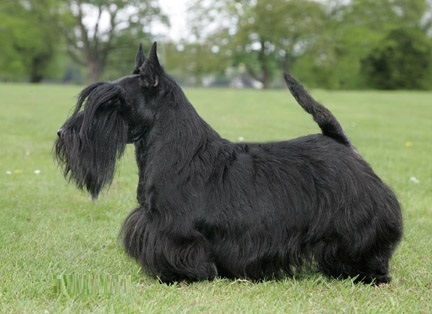 Scotties are muscular, compact, and having strong limbs and with an upturned tail. They have a high, slender head, long eyebrows, long jaws, small ears and a big nose. They are not good with children. They are most likely below average in terms of relating to cats or other pets unless they are raised together. 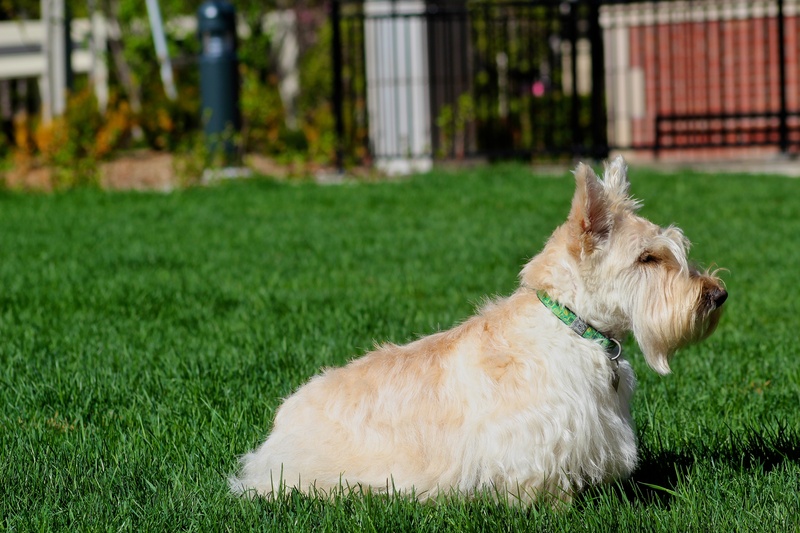 They are average or below average in terms of relating to other dogs. Although they are poor in many respects, they do excel at being a good watchdog. It is relatively easy to groom them. 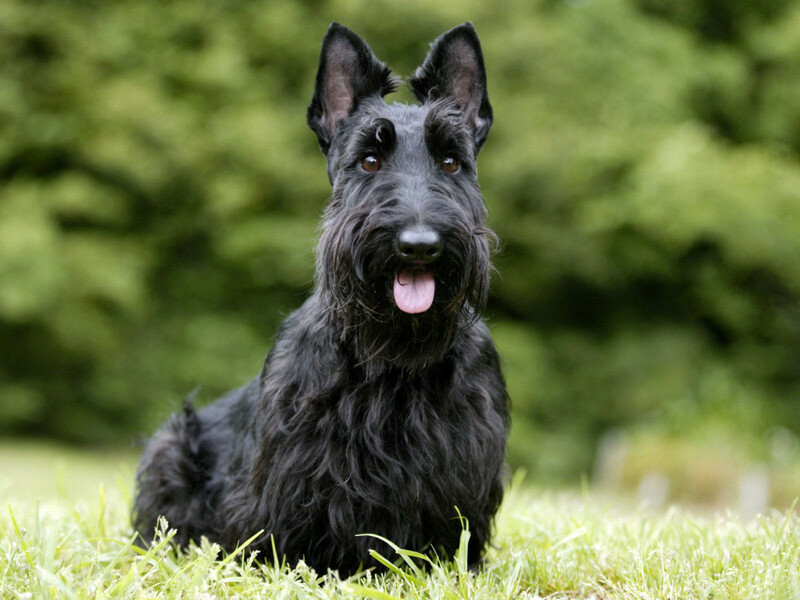 Scottish Terriers are slightly above average in popularity. They adapt in an average way. They prefer cool climates. When they have puppies, the litter size is 2 to 5 puppies. 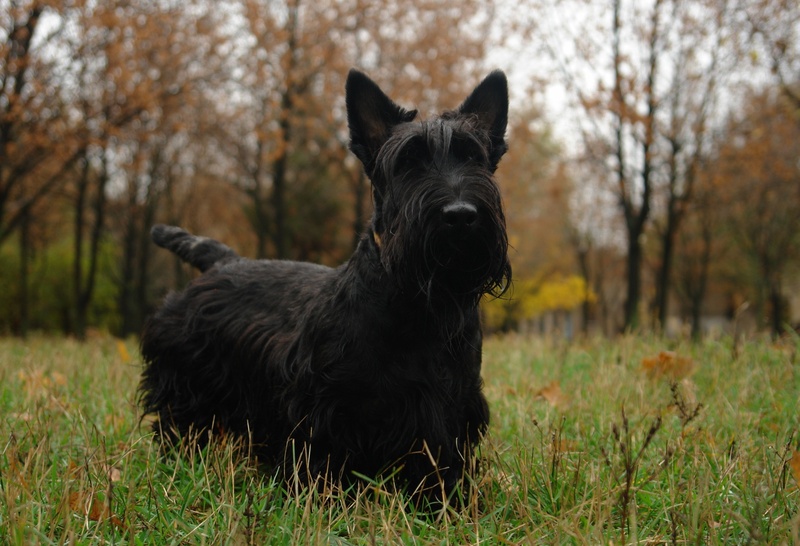 It should be fairly easy to take care of the Scottish Terrier as long as it is properly trained and that all family members are capable of ensuring this. Although they are prone to having multiple medical issues (primarily as a result of genetics), they do not seem to need any specialized dietary requirements. 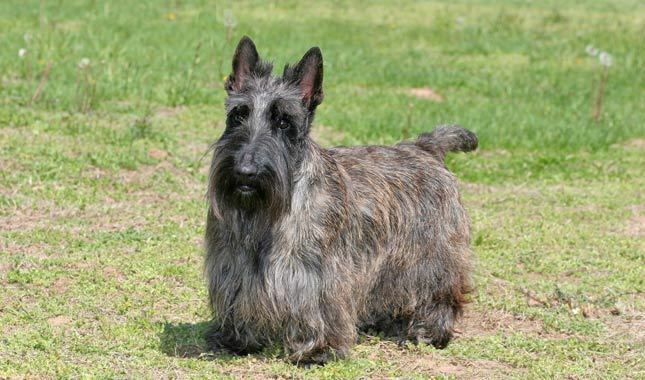 They are closely related to the Skye Terrier.